Thembi Mutch is a global studies research associate at Roehampton and Sussex Universities, working on a collaborative post-doc project that explores narratives of modernity and cultural ventriloquism in Tanzania, related to the Chinese pipeline and the discovery of oil and Liquid natural gas. She completed her PhD, Women in Zanzibar: their discussions around Media and Modernity, at SOAS, University of London, in 2015. 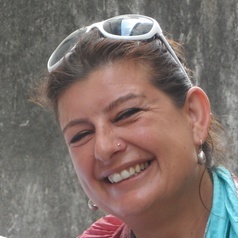 Her research interests include: representation ethnicity and gender, China in Africa, race and diversity, Southern conversations (and Northern deafness), Tanzania coastal environments, media in East Africa, human rights and advocacy in East/Southern Africa, competition for resources in East and Southern Africa, pastoralism and landrights, mining, and human trafficking. Before academia she has worked for over 20 years as an journalist, covering African arts and human interest and history for various World Service and Radio 4 outlets. She has worked extensively with the BBC: on radio programmes including Woman's Hour, Newshour, Farming Today, Musical Migrants and several documentaries. On television including various BBC, Channel 4 and European stations. Thembi is an NTCJ freelance journalist, published by the The Guardian, Al Jazeera, Interpress Service, The Ecologist, Financial Times, Focus on Africa, Think Africa, Resurgence, The Ecologist, The Conversation, and The Daily Telegraph among others.he has lectured at Sussex University, London University (Birkbeck and SOAS) South Bank University, Brighton University and Birmingham University on various graduate and post graduate Journalism and Media Studies Courses. She has won the Prince Rainier iv award for investigative environmental journalism (2007) and been shortlisted for several others.